Representatives of Curtin Sarawak and AICB pose for a group photo. 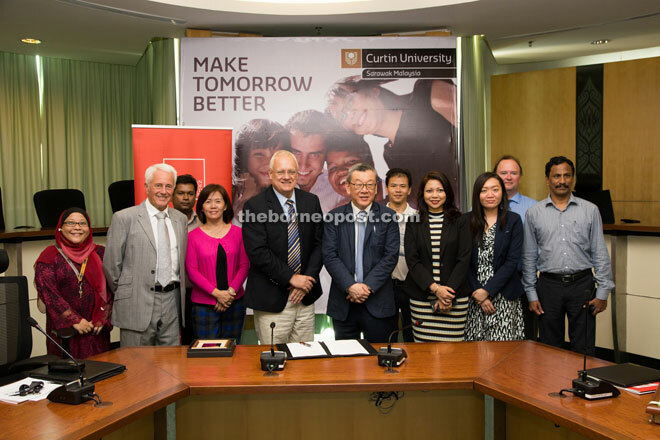 MIRI: Curtin University Sarawak and the Asian Institute of Chartered Bankers (AICB) are collaborating in a number of education-related areas. This commitment was contained in a memorandum of understanding (MOU) signed at the university here recently. Curtin Sarawak was represented by its pro vice-chancellor and chief executive officer (CEO) Prof Jim Mienczakowski and its Faculty of Business and Humanities dean Prof Jonathan Winterton, while AICB sent by its CEO Tay Kay Luan and head of marketing and communications, Kristine Anne Williams. “The MOU would pave the way for significant collaboration in the sharing of leading practices and knowledge in banking trends and developments. Both parties can also share experiences in relevant research and the teaching of banking and finance courses and expertise through collaboration in thought leadership activities such as forums and seminars. “Such co-operation provides both students and academics vital industry exposure and the opportunity to interact with and learn from industry professionals. “The MOU would also facilitate the awarding of AICB awards for Curtin Sarawak’s best graduates in Accounting and Banking, as well as Banking and Finance at the annual awards event,” a spokesperson of the event said. Mienczakowski, in his speech, said the MOU should augur well towards rewarding qualifying graduates, especially in academic excellence and in line with the university’s aim to provide quality education and equipping students with the necessary living skills for the success of their future careers. “Therefore, it is an honour to be able to work with AICB — the professional body for the banking and financial services industry in Malaysia — to not only add credence to our commerce programme and give our graduates that added edge in their future careers, but also to collaborate towards raising industrial relevance and standards in the delivery of our courses,” he said. Tay, meanwhile, remarked: “AICB places significant importance on knowledge transfer and with an appetite to understand rapid and complex changes in the industry, I’m certain that leveraging on both parties’ strengths and capabilities would allow us to attract more quality talents and elevate bankers’ professionalism in this industry.